Halloween gives you a reason to dress up as any character you want. You can stand out in a crowd by dressing as one of the characters from the bible like an angel, a wise man, a shepherd, Joseph, Mary or Jesus himself. For young girls, Halloween is a great time to dress up like angels making them feel angelic. Biblical costumes are used for Halloween which is indeed a novel idea. They instill faith in children and make them religious. You can send a message to their friends and peers through costumes without fear of any retaliation. Angel costumes are popular in demand, so ensure that you purchase it from our store for your little one. We offer great prices for angel wings and the tiara that are high in quality making your kid look heavenly. Children usually prefer pretty and innocent looking costumes rather than scary ones. The angel is a pretty costume and can be used for many other occasions and may simply give your girl a chance to dress up. While dressing up your children in biblical costumes, you get a chance to talk to them about the bible and religion. If your child is attending Sunday school at Church then find out which character he wants to portray. Pretending to be somebody else will make the kids think like them. Such costumes never go out of fashion giving you the benefit of using it again at some other party. We have earth and sober colored costumes for Joseph and Mary. And for the wise men we have bright colored robes. 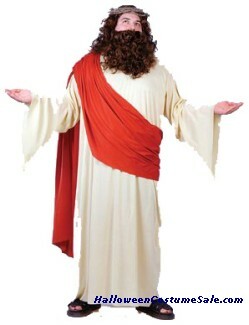 We also have the holy Jesus costume with the wig and the beard.